Frame: A strong, hot-dip galvanized inside and out and powder-painted (optionally), with a set up to 30 steel eye-bolts allowing you to attach additional equipment (such as curtains, lighting, hanging beds and etc.) directly to the structure of the dome. Anchor Plates are included and provide for permanent installation on wooden and concrete flooring surfaces. Every Strut is stamped at one end with a number and letter code that identifies the Dome model and particular Strut lengths. This is specially made for DIY self assembly geodesic dome kit. Cover: A customizable opaque/translucent cover with a round, smaller transparent bay window comparing to event domes. 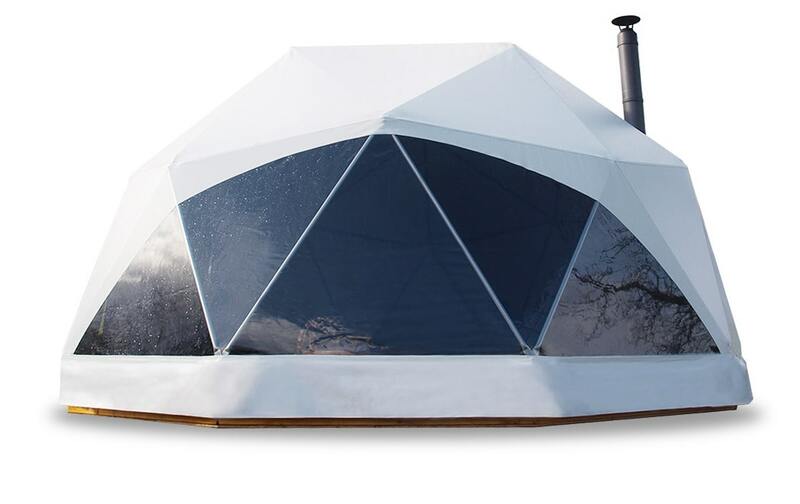 All of our membrane covers are made of three-layer PVC material with B1 fire resistance certifications, a copy of which is included with every Geodome. Door: Each Polidomes structure comes with 1 zip in entrance as standard. Each Polidomes pod comes as standard with a completely removable, fabric door panel. Each panel can be rolled up and secured with ties located at top of the door. Each panel can be completely removed by using the horizontal zipper located at top of the door. Insulation: We offer high quality special made termofoam cover as a best insulation option in the market. Stove: Flashing storm collar, stove cap and stove struts included in the package (for your own wood stove). Ventilation:Special custom made caps at the top of the dome for natural air circulation. A circular opening to which climate control systems can be attached.